Luke Bryan Holds off a late push from Tyler Farr to remain #1. Farr’s debut “Redneck Crazy” breaks in at #5 in the all-genre chart, giving Country music 40% of the Top 5 albums this week. Luke Bryan surpassed the 1,000,000 albums scanned mark, making Crash My Party only the 7th album -- all genres -- released in 2013 to hit the feat (It was already certified Platinum by the RIAA). 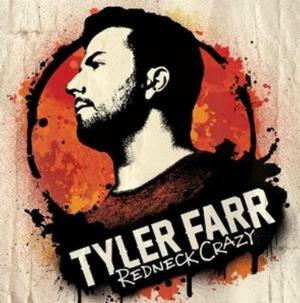 Tyler Farr was less than 2,500 copies away from scoring the #1 album in Country music this week with his debut Redneck Crazy. The rising star’s debut for Columbia Nashville. Tyler’s title track single scored him his first #1 hit when it scored the Mediabase #1 slot this week (More details about that success here). Tyler sold 29k in his first week. Florida Georgia Line’s debut album Here’s To The Good Times has now sold 1.138 million copies and sits at #3 this week while the #1 album from 2 weeks ago, Justin Moore’s Off The Beaten Path sits at #4 with 137k sold to date. Alan Jackson’s The Bluegrass Album sits at #5 with sales now at 35k in two weeks. Keith Urban Fuse Again One of Country Music’s Top-selling albums. Hank 3’s Brothers of 4x4 debuts in Top 10. Keith Urban’s latest album, Fuse, sits at #6 this week and has moved 159k in one month on the charts. Blake Shelton’s RIAA Certified Platinum Based On A True Story… has scanned 916k to date and will be one of 2013’s scanned platinum albums by the time the holiday shopping season is over whereas Chris Young's A.M. sits at #7 this week with sales now at 81k for his fourth album for RCA Nashville. Jason Aldean’s 2012 release Night Train has moved 1.440 million copies to date and sits at #9 while Hank3’s latest album Brothers Of The 4x4 debuts at #10, one of the highest positions of the grandson of Hank Williams has ever achieved. Sheryl Crow, Taylor Swift, Carrie Underwood and Colt Ford lead Notable Albums this week. Sheryl Crow’s Feels Like Home slides out of the Top 10 after a month on the charts with sales now at 65k for her debut Country music album while Billy Currington has moved 40,000 copies of We Are Tonight after 3 weeks in stores. Meanwhile, Taylor Swift’s RED has now moved 3.83 million tracks. Carrie Underwood’s Blown Away album has moved 1.546 million units to date and gained 29% in sales while Colt Ford’s first album Ride Through The Country returns to the chart with sales now over 353k total. Colt's return is due to the revisited version of his Average Joes Entertainment album, a release that re-recorded all of the basic tracks of the album and brought in special vocal guests like Ronnie Dunn, Joe Diffie, Wynonna, John Anderson, The Lacs, and Charlie Daniels. You can listen to "Mr. Goodtime" featuring Ronnie Dunn here.